A trio of menfolk have been making waves recently, as their looks can attest. Chadwick Boseman: At The Hollywood Reporter’s Power 100 Women In Entertainment event on Wednesday (December 5) in LA, Chadwick would not be left on the sidelines in this Calvin Klein ensemble. It was a power look in and of itself with its mishmash of plaid and patterning. It’s never a dull moment with Chadwick, and he proves that men can mix and match prints just as well as women with this quirky look. Robert Pattinson: Dapper is the only way to describe Rob at the 17th Marrakech International Film Festival opening ceremony on Friday (November 30) in Morocco. His Dior Men midnight-navy and black tux was handsome, dark, and moody — kind of like him. 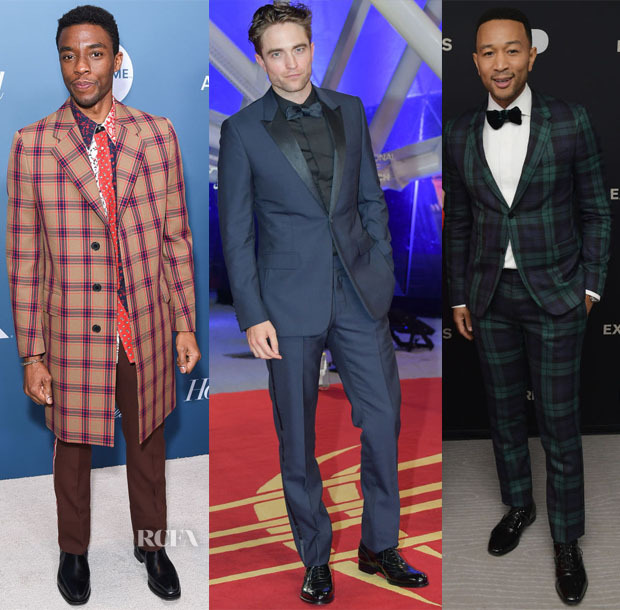 John Legend: Also going mad for plaid, the singer suited up in a Valentino design that had me falling in love with the pattern all over again as, somehow, it doesn’t overwhelm here. Naturally, he was dressed to impress at his namesake John Legend: A Legendary Christmas powered by Pandora x Express event on Wednesday (December 5) in New York City.